I have been meaning to do a tutorial on how to patch up the inevitable holes that appear on soaps every now and then. To show you how overdue this post is, the pictures below were taken last August 6, 2014. The photos were hastily taken using my camera phone and not in the best possible light. I will confess that I don’t like taking pictures of soaps that have not been cleaned up, and the only way to get through the chore was to do it quickly. 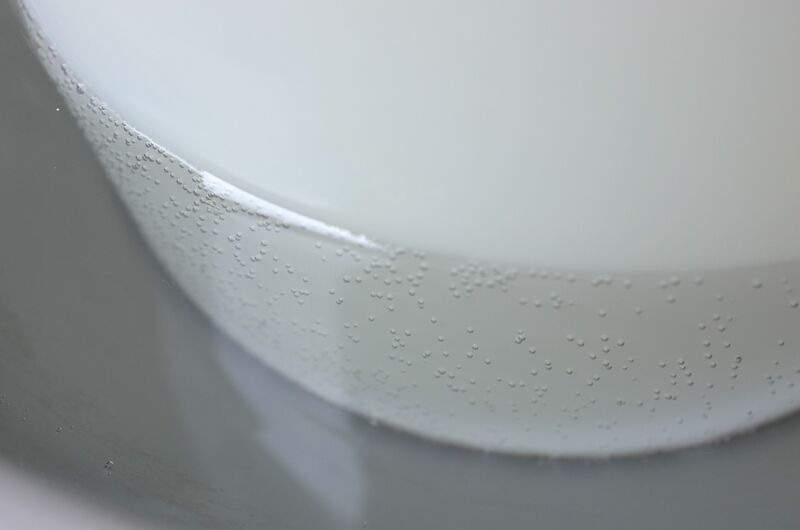 Holes are nothing but trapped air bubbles. 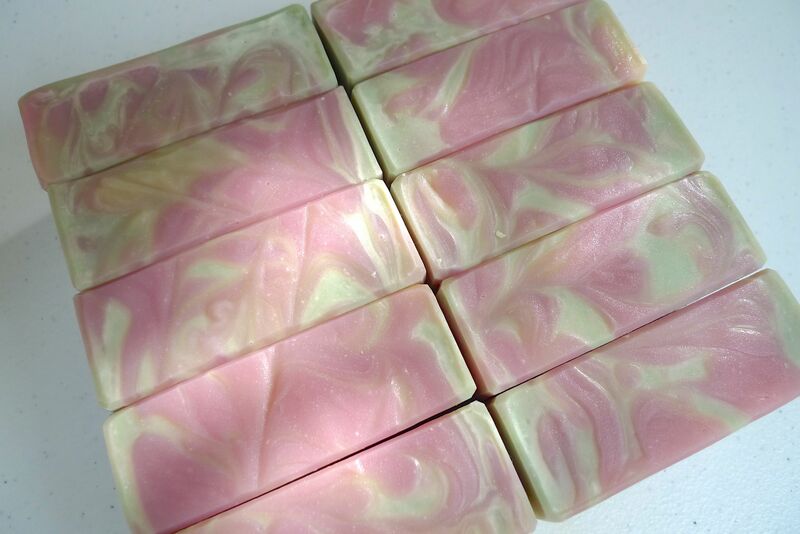 They usually appear in soaps with design, and especially when the soap batter starts to thicken before it can be poured into the mold. Banging the mold helps release trapped air but doesn’t guarantee complete removal. Just like soda ash, holes are nothing but an aesthetic nuisance, and the ones most bothered by them are the soap makers. Some soaps are simply beyond repair and are better off rebatched or chopped up as embeds. Most, however, simply need a little reconstructive patching up and they’re good as new. It takes time, patience, and a light touch to leave as little “scarring” as possible. Some can’t understand the work that goes into prettifying soap that’s just going to melt anyway, but soapmakers tend to be quite passionate and obsessive about their craft. 1. This was my first camo soap. I made my own fragrance blend with woodsy notes of oak and fir, balanced out by honey, saffron, vanilla, and eucalyptus. It smelled awesome and was popular with the boys, but it accelerated trace, hence the the holes. 2. For this simple operation, we need an offset spatula, toothpicks, and soap trimming to fill up the holes. The triangular thing beside the spatula is some kind of pottery tool that I picked up when I went to Jingdezhen last year. I don’t know what it’s called, but at that time I thought I could use it as a swirling tool. Well, I never used it for swirling, but intuitively it was perfect for smoothening surfaces – soap or otherwise! It’s great to have, but an offset spatula is perfectly sufficient. 3. Like a dentist, I probe how deep and big the cavity is using a toothpick. Some holes may appear deceptively small, but is actually a long tunnel under! 4. Once you’ve assessed the size of the cavity, massage the required amount of soap trimming into a smooth and malleable ball or log – the consistency of play dough. Push the soap into the cavity using a toothpick. Keep at it until you can’t push in any more. 5. Flatten patched-up portion with the offset spatula. Wipe it clean. Tilt it at an angle and scrape off excess, in the same way that I did with the pottery tool in the photo. 6. And there you have it! After the soap fully cures, the colors will even out and the patches will hardly be noticeable. 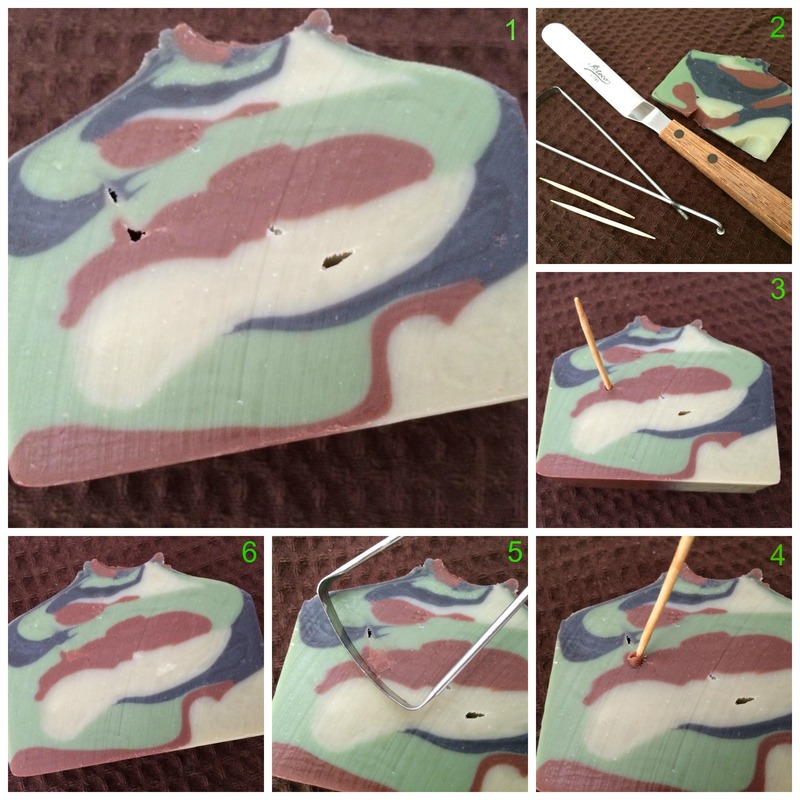 This entry was posted in Cold Process, Tutorials and tagged Camo Soap, Patching Up Soap, Repairing Soap on January 20, 2015 by soapjam. I will be out of town the next couple of weeks. It will be a reluctant break from my soapmaking mania, but I am excited to be in Honolulu for the Hawaii Food and Wine Festival and to be visiting my sister in California after. Yipee!!! 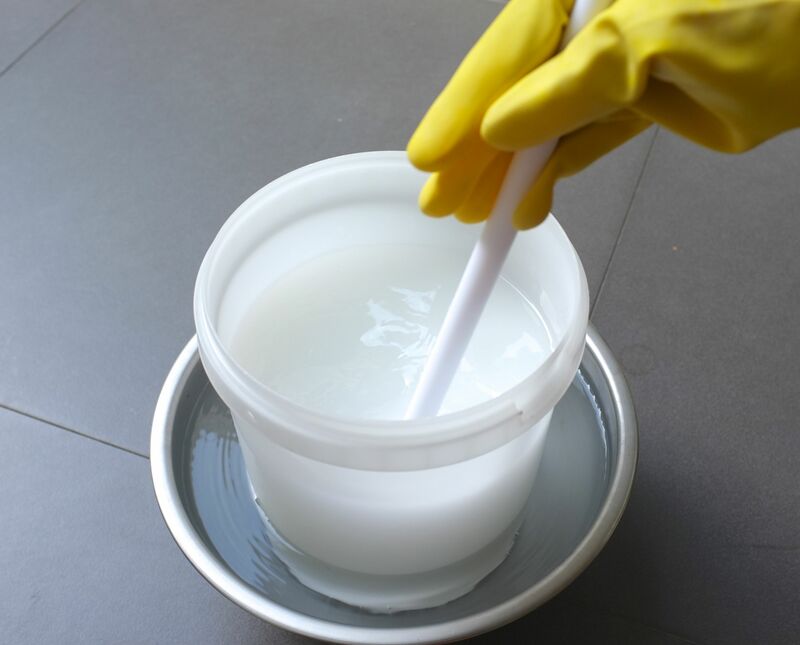 Before I take off, here’s a tutorial on lye master batching. *To learn more about what’s safe to use, you may want to check out this forum thread. 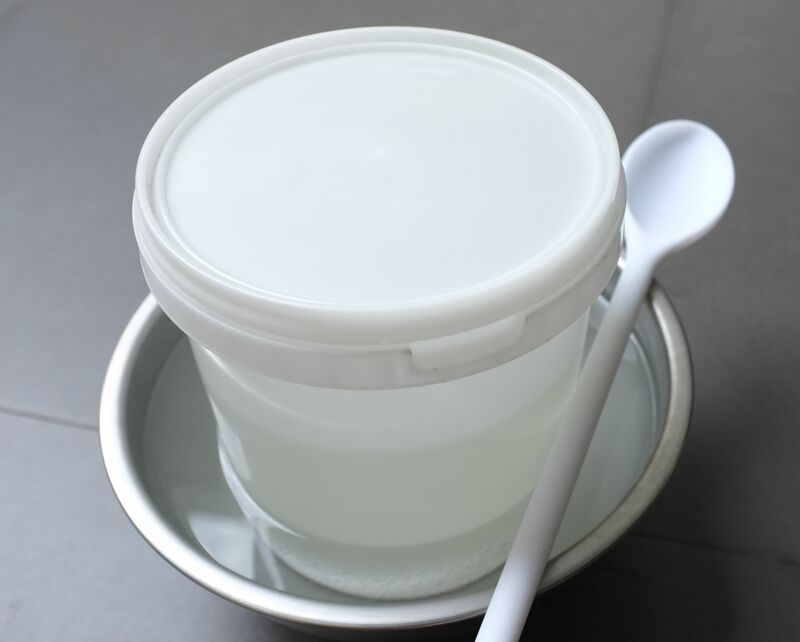 Avoid metal containers as you run the risk of turning your lye solution gray, and always have a container with a bigger capacity than what’s going into it. 2. Although you can mix the solution in the kitchen with the exhaust turned-on, I prefer to do it outside for better ventilation as the fumes are very biting and strong. 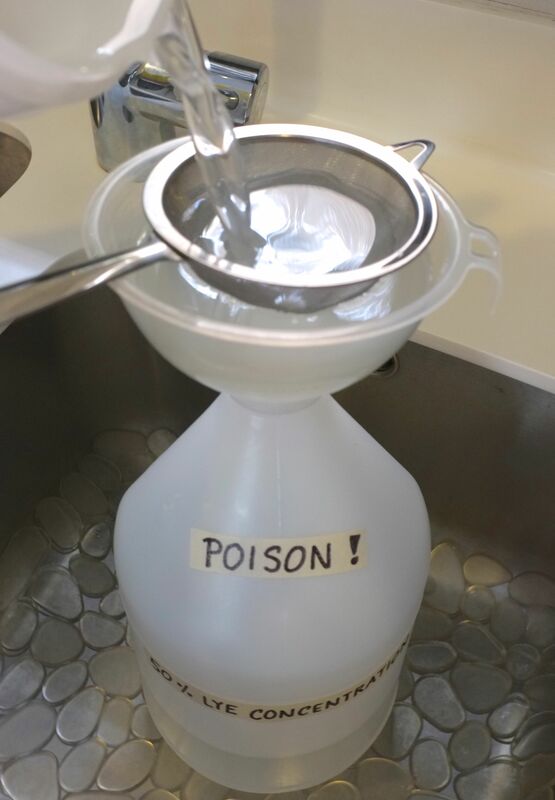 Just for added precaution so that the lye solution does not overheat, I always place the mixing container in a bowl filled with cold tap water (think nuclear reactor). 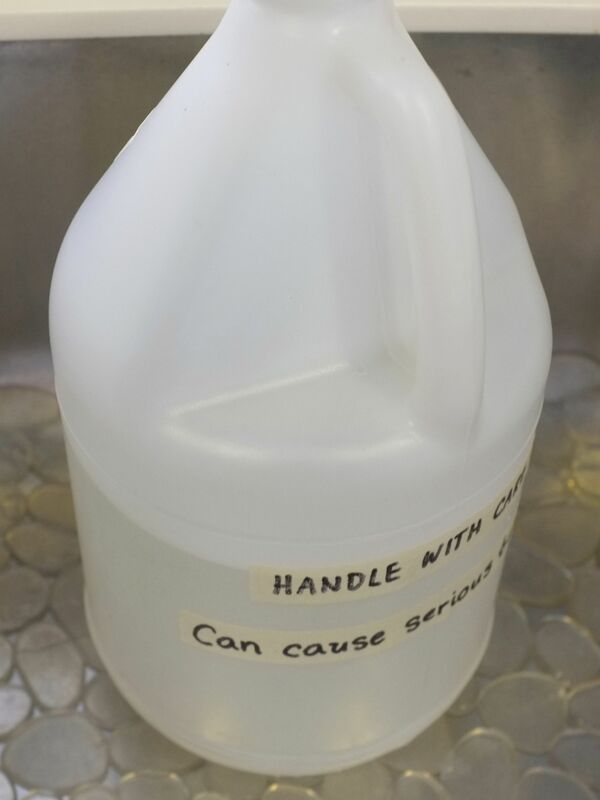 With safety gear in place, it’s time to pour the NaOH into the container with distilled water. 3. Cover your nose (I just hold my breath) and stir until the NaOH has been completely dissolved. 4. Cover the container loosely to prevent debris from going in and to prevent rapid evaporation. If I make the lye solution before going to work, I transfer it to a bathroom that no one uses. By the the time I come home, it would have cooled down already. Alternately, this can be done at night and left to cool down overnight. The net weight of the solution is 4 kilos or 8.8 pounds, but since the solution is very dense, its volume is approximately a little over half a gallon. 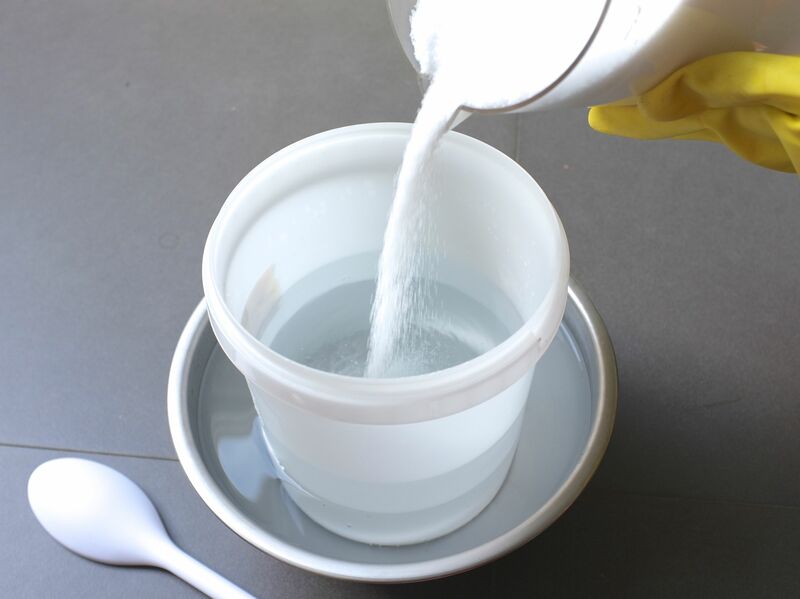 To avoid confusion, I will be using the term lye pre-mix to mean master-batched lye solution and NaOH to mean DRY lye or caustic soda. 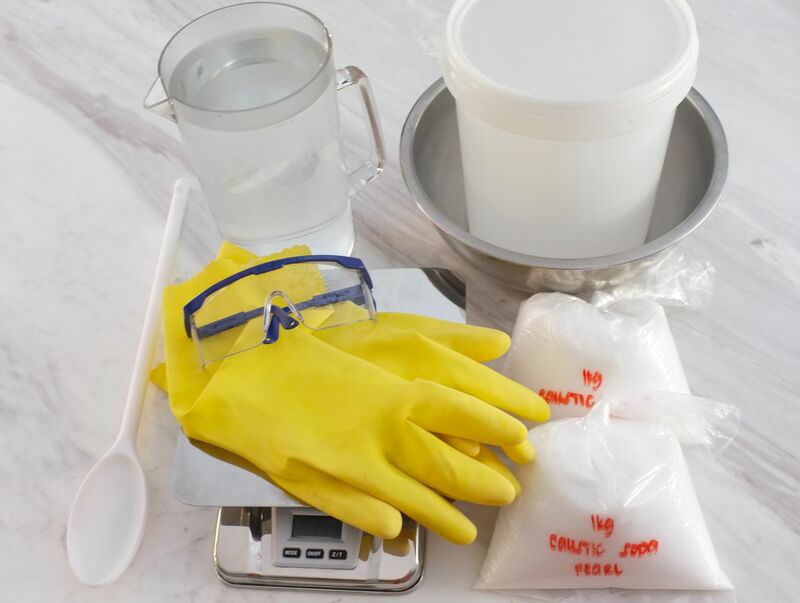 Original recipe: 265 g. water + 130 g. NaOH = 395 g.
Recipe with pre-mix: 135 g. water + 260 g. lye pre-mix = 395 g.
Note: Mixing the lye pre-mix with additional water or any form of liquid will cause the whole thing to heat up again! Unless you actually prefer to have it hot to melt hard oils or for whatever reason, I suggest mixing your water/milk/juice directly into the oils, then adding in the lye pre-mix after. I don’t master batch my oils because I like playing with different recipes, but I can’t imagine going back to weighing and mixing lye every time I have to make soap. I just love the ease and convenience, and in my opinion, it’s really no more dangerous than having to dissolve solid NaOH every time. Needless to say, extra precaution has to be taken when dealing with any hazardous substance. When I need to use some lye pre-mix, I just pour directly from the jug. I don’t even shake it because I think the the NaOH has dissolved and bound completely with the water. But that’s just me. I guess there’s no harm in shaking it up a bit before using, if that makes you feel better. This entry was posted in Cold Process, Others, Tutorials and tagged Cold Process, Master Batching on September 1, 2013 by soapjam. Nowadays, when I am making soap, I don’t think about soda ash anymore. I have taken a zen approach to it: if it’s there, then it’s there; if it’s not, then well and great. But previously, I was really on the hunt on how to avoid it. I tried all sorts of tips gathered from books and the internet: from using beeswax, to spraying with alcohol, to covering the soap surface, to steaming. From my experience, beeswax does not guarantee a soda ash-free soap; the same goes for spraying with alcohol. Covering the surface works, but it can leave crease marks and air pockets; steaming works too but it is time consuming and a bit dangerous to hold a soap bar over a steaming kettle. I’ve also tried holding an entire loaf over steaming water. Some of the ash came back after a few days, but it could be that the soap was getting slippery so i did not get to steam it long enough. Last June, after making a batch of soap that had soda ash, it started to rain. The following day, I noticed that the ash had disappeared and the soap was a bit moist from the high humidity. This gave me the idea to place a “tent” (using an inverted container) over the soap, together with a bowl of hot water, to trap the steam. So far, I’ve found this to be the most efficient and effective way of removing soda ash. For bigger batches, this can be done in an oven or in any enclosed space for that matter. 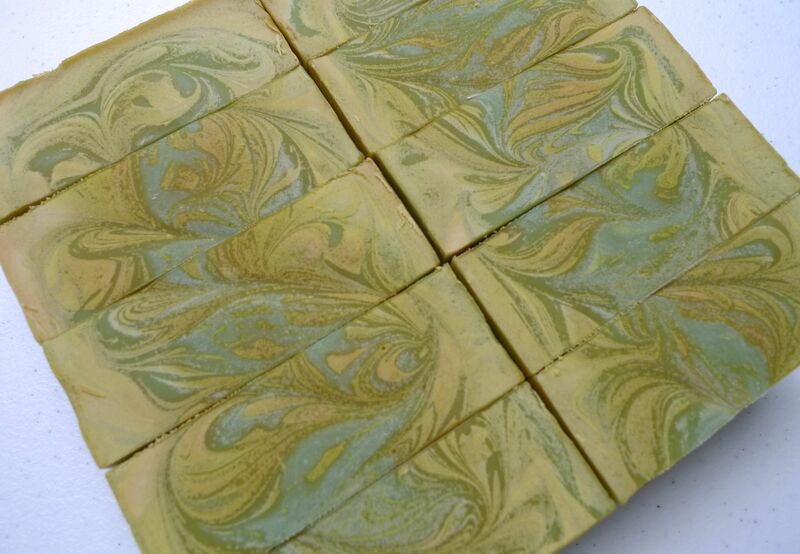 Here is a batch of ashy lemongrass verbena soap that I steamed this afternoon. 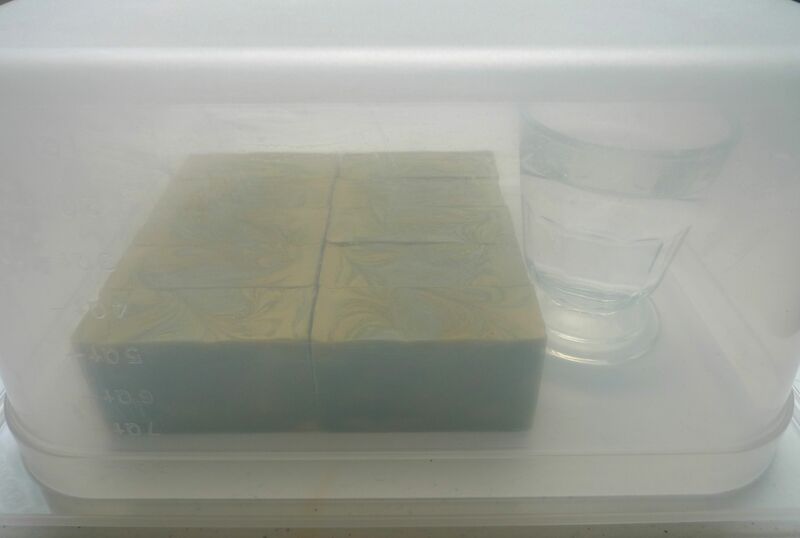 While it was steaming, I took pictures of my other soaps. I estimate that I left it to steam for around 20-25 minutes. 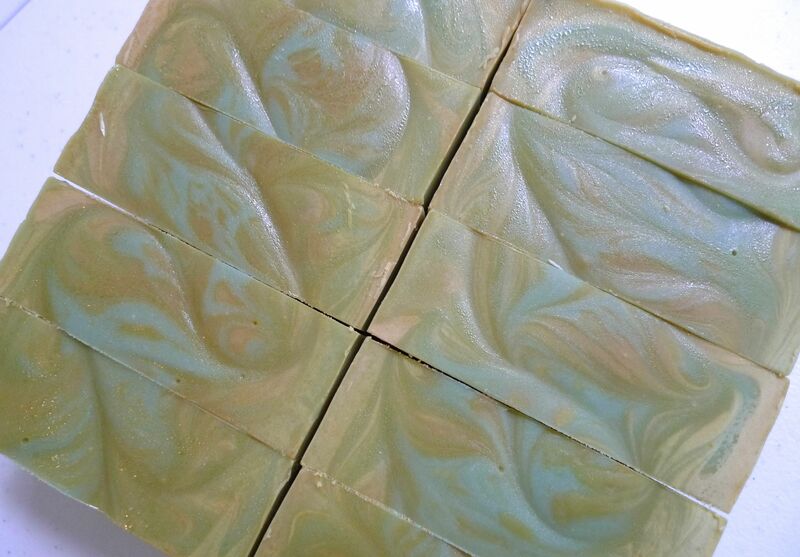 Lemon verbena soap covered with soda ash. 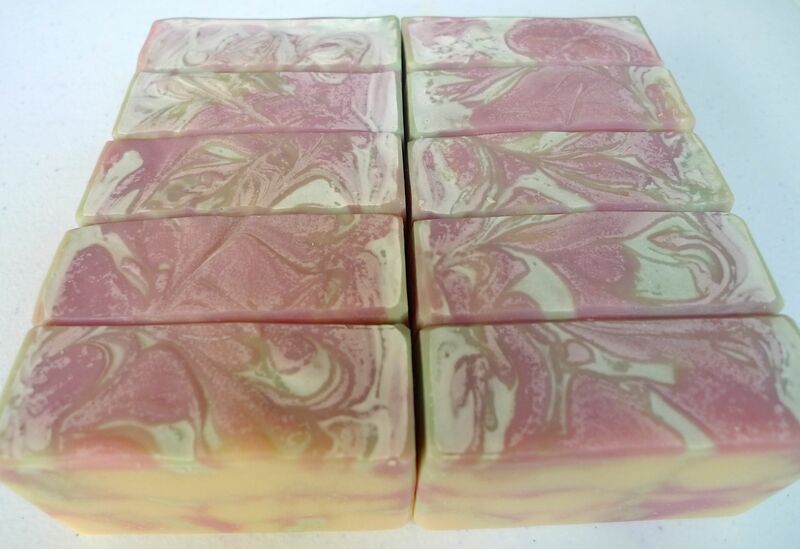 Japanese Cherry Blossom soap before steaming. This entry was posted in Cold Process, Others, Tutorials and tagged Cold Process, soda ash on July 31, 2013 by soapjam.